The Mercedes G-Class comes in three different trim levels to match their engines. 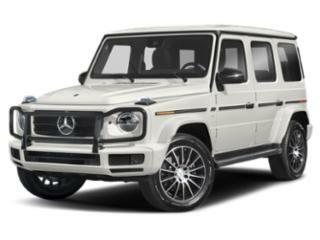 The G550 is powered by a 4.0L twin-turbo V8 making 416 horsepower which it sends to all-four wheels via brand new 9-speed automatic transmission, a first for the G-Class. This combination is enough to get the G-Class to 60 mph in just 5.6 seconds, making the boxy SUV incredibly and surprisingly quick. For those wanting comical levels of power, Mercedes has owners covered and then some. The AMG G63 has a bigger, 5.5L V8 twin-turbo engine making 563 horsepower, while the top-of-line AMG G65 gets a 6.0L V12 with twin turbos making 621 horsepower. With all that torque, Mercedes had to make do with a more robust 7-speed automatic, though power is once again sent to all four wheels. Standard features on the G550 are abundant: 19-inch wheels, LED daytime running lights, adaptive LED headlights, keyless start, rain sensing wipers, leather seating surfaces, power heated front seats, heated rear seats, a power sliding sunroof, 3-zone climate control, an electrically heated windshield, heated mirrors, a 12.3-inch screen with Mercedes' COMAND system and navigation, hands-free Bluetooth connectivity, a Burmester surround sound system, and Apple CarPlay. Being a fully modern vehicle, the G550 also comes standard with a blind spot assist system, active lane keeping assist systems, park distance control, PRE-SAFE pre-collision system, a rearview camera, rear cross traffic alert, an active parking assistant, Trailer Stability assist (and a trailer hitch) as well as a start/stop system to save a little on fuel. In order to upstage its less powerful sibling, the two AMG models come standard with a choice of various Napa leather interiors, one of several premium wood interior trims, 10-way power adjustable front seats with heating and venting, a bigger, Harman/Kardon LOGIC7 sound system, voice activated controls, bi-xenon headlights and 20-inch wheels.